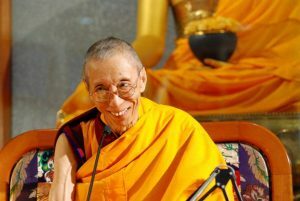 Venerable Geshe Kelsang Gyatso, founder of NKT-IKBU, is a truly remarkable person. Born in a remote village high on the Tibetan plateau he ordained as a Buddhist monk at the age of eight and spent the next twenty years studying the teachings of Buddha in the great Tibetan monasteries. After concluding his studies and being awarded the title ‘Geshe’, which means ‘virtuous spiritual friend’, he entered a life of meditation, engaging in deep retreat at first near the Nepali border and later in the mountains of northern India, where he soon developed a reputation as a great meditator. After almost twenty years in retreat, in 1977 at the behest of his own Spiritual Guide, Kyabje Trijang Dorjechang, Geshe Kelsang graciously accepted an invitation from Manjushri Centre to travel to the West and become the Resident Teacher at what was then a fledgling Buddhist centre that had recently acquired Conishead Priory as its base. Since that time Manjushri Centre has been Geshe Kelsang’s spiritual home, where he has given thousands of teachings. Many of these teachings have been published in 23 highly acclaimed books on Buddhism and meditation, including his latest title, The Mirror of Dharma. He understands the problems faced by modern people and shows how we can solve them through simple scientific methods taught by Buddha. But though his teachings are extraordinarily clear and easy to understand they contain the entire profound lineage of ancient wisdom he holds. 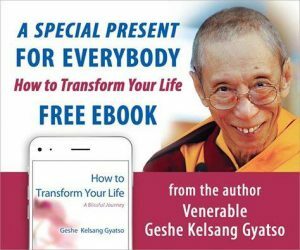 Geshe-la’s oft-repeated phrase, ‘simple, but very profound’ perfectly encapsulates his uncommon presentation of modern Buddhism. 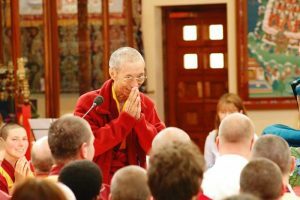 While at Manjushri Centre Geshe Kelsang designed and oversaw the construction of the first Kadampa Temple for World Peace, and inaugurated the International Temples Project with the intention to establish Buddhist institutions such as Temples throughout the world. Over the years, Geshe Kelsang has founded more than a thousand meditation centers and groups in over forty countries, and has established three study programs – the General Program, the Foundation Program, and the Teacher Training Program – to be taught continuously at these centers. He has trained hundreds of teachers and ordained scores of monks and nuns, and transmitted a complete lineage not only of teachings and insights but also of prayers, ritual practices, sacred art and music, all tailored to the needs of the modern world. 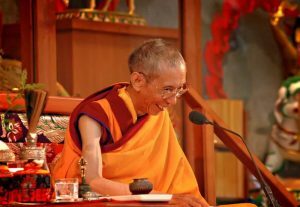 Though he has now formally retired as Spiritual Director, even at the age of eighty six he continues to work tirelessly to spread the precious teachings of Kadampa Buddhism throughout the world with the intention that each and every living being will eventually experience the supreme permanent mental peace of enlightenment. Check out our progress toward our $10,000 goal.